I am busy dreaming and scheming of stitching quilts and have recently developed a new appreciation of Civil War style quilts. It all started when I went digging and pulled out an old medal that was awarded to my great grandfather on my dad's side of the family. 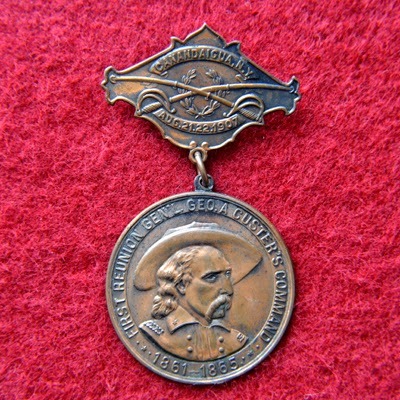 On the front is a facsimile of General Custer and around the edge it says, "First Reunion Gen'l. Geo. A Custer's Command 1861-1865. 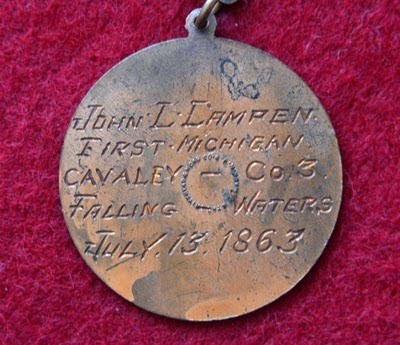 It is inscribed on the back, "John L. Campen, First Michigan Cavalry--Co. 3, Falling Waters, July 13, 1863. At the top it read Canandaigua, N.Y., Aug 21-22, 1907, placing this event 44 years after the battle at Falling Waters. Engraving on the back side. 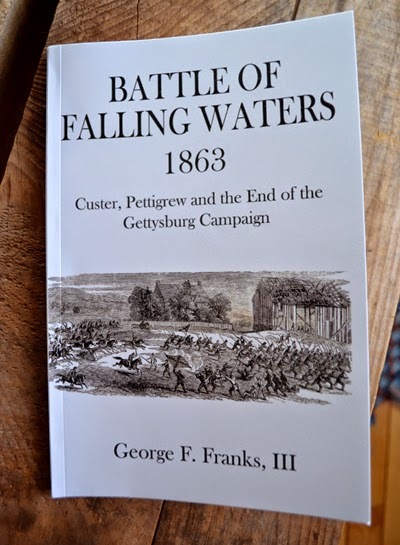 My daughter and I looked up this event on-line to learn that it was one of the battles in the Gettysburg area during the Civil War and my husband gave me the book, Battle of Falling Waters 1863 for Christmas. This book doesn't read easily for someone who is challenged by a compass and maps, as it is all about the battle plans and what did and didn't happen. I found another book, At Gettysburg, or, What a Girl Saw and Heard of the Battle...a True Narrative that was definitely a more understandable version of a piece of Civil War history. It was written by Mrs. Matilda Pierce Alleman who was but a teenager at the time of the war. Her neighbor thought she would be safer if she left Gettysburg and traveled miles away to a nearby relative's home, and instead of escaping danger finds herself right in the middle of battles all around her. It is her first-hand personal narrative of the horrendous circumstances of this war. This young woman was staying at the Weikert's home which was suddenly and unexpectedly used as an emergency hospital. She wrote about soldiers waiting in line to have a limb amputated or shrapnel of the day pulled from their wounds and there being fields of dead men and horses that lay rotting waiting to be buried! The Weikert family did as others did during this time, doing all they could to serve and care for the Union soldiers and worked hard to stay out of the line of fire. She ended her book with heartfelt appreciation for the huge sacrifices that were made for the civil rights of this country and reported that veterans returned to her home town of Gettysburg years later to relocate civilians to thank them for their care. The covert of this book shows part of the famous Jane Stickle quilt. I found myself then pulling out my Dear Jane quilt pattern book. 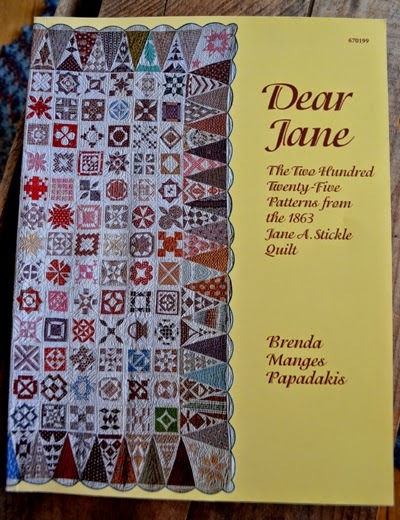 It features the patterns and story about Jane Stickle and her famous quilt that is located in the Bennington Museum in Bennington, Vermont. We have been to see it and it is truly an amazing quilt. Little is known about Jane Stickle except that she made it during the civil war, and that she and her husband were separated and suffered financial ruin. Her quilt is the story of many women that lose themselves in their needlework, making something beautiful from whatever scraps could be obtained! Her quilt has 225 blocks that are each entirely different. The author indicates that if you are off in your stitching by so much as an 1/8th of an inch your blocks will not fit together. This is likely true for any quilt really, though I simply make my blocks fit together with an occasional pucker from gathering it a bit when I need to. My youngest daughter's eye always finds these spots immediately while her boyfriend admires how perfect my work is, oblivious to the wrinkles. Beauty is clearly in the eyes of the beholder, though Jane Stickle's quilt is admired by everyone and really is quite perfect!! 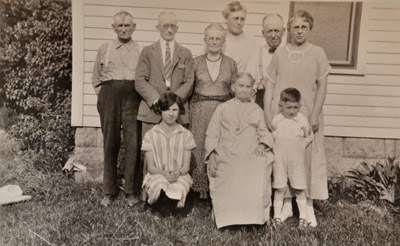 60th Anniversary picture of my great grandfather and great grandmother. John L. Campen "and his hat" on the far left, my father the little boy. 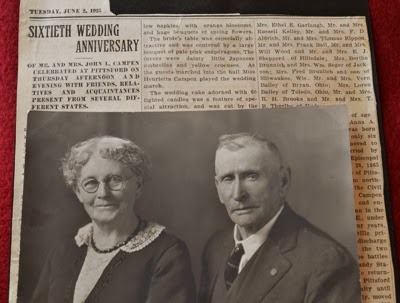 From 60th Wedding Anniversary newspaper article. Note Civil War info. I am so proud of my grandfather's legacy and that of others like him that gave themselves so completely during the Civil War. Many were not lucky enough to survive and still others did so only with permanent disabilities or severe emotional trauma having experienced the ravages of this brutal war to obtain freedom and civil rights for all people. Many fought wet, hungry and/or barefoot. In one battle alone it is reported that 8,000 pairs of boots were lost in the mud!! I am also proud of the women of those years that stitched away on their quilts while bravely and courageously doing what they had to do, taking over running their farms caring for their families and even picking up guns to protect themselves. Their needlework is part of this great legacy and left as proof of their perseverance and tenacity to put needle to fabric when they were filled with worry. In contrast to Civil War days, I marvel at how computers have made it easy to shop for Civil War reproduction fabrics. This week I learned that I can apply my Pinterest skills to save images of fabrics found on Ebay and Etsy and pin them to a board to see how they go together. It may not be quite as good as actually shopping in-person, but the snow is deep and the convenience of shopping stores all across the country with my fingertips on-line was too tempting to be passed up. My Pinterest board with pins of civil war materials that I was trying to match. I could not only see how well fabrics go together, but by shopping so many different stores, I was availing myself to more choices at better prices and if I was very careful, I could get materials sent with free shipping, to be delivered to my door and all while sitting in my pajamas in front of my computer!! I also found that notes were added automatically of the names of the fabrics, their manufacturers, and can be simply clicked on to trace them to the various stores selling them. I could also add notes as to the price and quantity available. I will let you know how true to color the pictures are when I receive the fabrics! If only I could cut and stitch my quilts with the same ease, though truly reading about Civil War times, I had to stop and realize that this war was fought by someone that my father knew in-person, albeit, my great grandfather was in his eighties and my father was but a small boy. But that made it very real that it wasn't that long ago! How different are the times that we live in now and how advanced our technology has become, though I realized that sadly we are still fighting for civil rights today! I have only scratched the surface when it comes to learning about The Civil War battles and about what my great grandfather experienced. Another newspaper article went on to say that he was in seventeen different prisons during the war, though each time he was able to escape. He did, however, spend a total of 363 days in various prisons, one of which was the Anderson prison. Only once was he injured and that was in the battle of Gettysburg when his horse was shot and he fell, hitting his head on a stone that apparently resulted in a permanent and "a visible scar". This same article said that when his wife, Annie Harford was a young girl, she was noted to be "a famous rider and breaker of horses". It is noted that she never used a saddle and had won 19 "premiums" and was the reciepent of a $125 prize at the State Fair for bare back riding. There is no record of her ever quilting, though I don't lack for "sewing genes" on both sides of the family and I am looking forward to getting back to quilting. I have many a quilt to finish and will take pictures as I go. 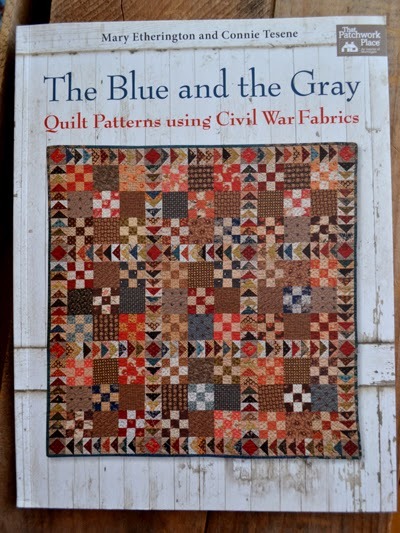 I am also seeing that there are many Civil War quilt books, with patterns and stories of the quilters of this time period. I have added the one below to my Jane Stickle pattern book! 2015 is indeed going to be a fascinating journey of sewing and reading! Labels: Battle of Falling Waters, Civil War Medal of my Great-great Grandfather's, Civil War Quilts, Civil War Reproduction fabrics, General Custer, using Pinterest to shop on line. Kiss 2014 Goodbye and Welcome 2015!